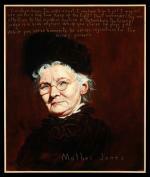 For thousands in the coal mining towns, Mother Jones was an angel of hope. To the propertied middle classes, however, she was "the most dangerous woman in America." Her photographs show a kind face, silver hair, wire-rimmed glasses, and always her old-fashioned black dress. But the woman herself is hard to know. 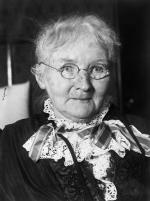 'Mother' Mary Harris Jones, circa 1910. Mary Harris ‘Mother" Jones, by Robert Shetterly, 2003. I was born in the city of Cork, Ireland, in 1830. My people were poor. For generations they had fought for Ireland's freedom. Many of my folks have died in that struggle. My father, Richard Harris, came to America in 1835 and as soon as he had become an American citizen he sent for his family. In a half dozen sentences, The Autobiography of Mother Jones dispatches her childhood. We don't know the names of her siblings, her family's church, if any, the maiden name of her mother. By page two, her unnamed husband(a "staunch" union man) and her four unnamed children are dead of yellow fever. Quickly the young widow Mary Jones, an independent dressmaker, immerses herself in the great battles of the day on behalf of the poor and downtrodden. It's almost as if she created, and then lived, a larger-than-life character. From the 1870s through the great steel strike of 1919, Mother Jones was a great passionate voice of American radicalism. With unflagging energy, she gave fiery, heart-felt speeches of inspiration to struggling coal miners as well as workers in the railroad, textile, brewing, garment, and steel industries. Rallying the faithful she traveled continually, to the hills of West Virginia, the mountains of Colorado, the plains of Peoria, the boulevards of Philadelphia, the anthracite coalfields as well as the steel towns of the Monongahela. "My address is like my shoes; it travels with me wherever I go," she said. Mother Jones leading a protest, circa 1903. The steel strike of 1919 brought her to the gritty streets of Pennsylvania's mill towns. During World War I, workers in the steel industry benefited from shorter hours, better pay, and the promise of union recognition. But after the war when steel companies reasserted the antiunion "open shop," a burst of rank-and-file militancy nearly overwhelmed a loosely organized "national committee." The coal miners" John L. Lewis, later a major force in creating the Steel Workers Organizing Committee, asked Mother Jones to go to the Pittsburgh district. 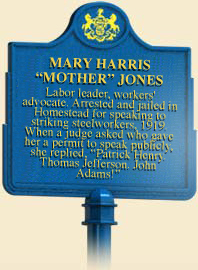 On August 20, police jailed Mother Jones in Homestead for speaking without a permit. When an unruly crowd of her supporters threatened the jail, she convinced them to go home peacefully. The next day, appearing before "a cranky old judge," she made a famous civil liberties speech that raised up Patrick Henry, Thomas Jefferson, and John Adams, but the judge fined her heavily, furious at her equating patriotism and unionism. Later that week union organizer Fannie Sellins was gunned down. On September 22, a quarter-million steel workers across the country walked off their jobs. It was the largest strike of steel workers the country had seen. Mother Jones with miners' children, circa 1903. During the fourteen-week strike Mother Jones spoke many times in the steel districts. In late October, an agent from the U.S. War Department's Military Intelligence Division described a speech of hers in Chicago as "the foulest and most profane that can be imagined . . . [teeming] with ultra-radical suggestions." She began the speech by inviting the government and company spies to move toward the front so they would report her words accurately. "We are to see whether Pennsylvania belongs to Kaiser Gary [chairman of U.S. Steel] or Uncle Sam," she told one audience. "If Gary's got it, we are going to take it away from him and give it back to Uncle Sam." Seemingly her finest hour, the 1919 strike was in fact fought out in terms that slipped past Mother Jones. In the repressive atmosphere of the postwar "red scare," most union organizers with radical sympathies kept them quiet. The fear of radical Bolsheviks taking over the country, however absurd, was common currency in many newspapers. The New York Times suggested, "The foreign element [was] steeped in the doctrines of the class struggle and social overthrow, ignorant and easily misled." In this tense and hostile climate, Mother Jones cheerfully - but naively - declared that she was, indeed, a Bolshevik in favor of taking over industry. Eventually the steel strike collapsed. In the difficult "lean years" that followed, labor leaders had no need of the fiery Mother Jones and kept her on the sidelines. Her autobiography appeared in 1925 when Mother Jones announced her age as ninety-five. (At the time, Mary Jones was, in fact, eighty-eight.) She died in 1930. In 2003 Homestead designated the intersection at Ninth and Amity as "Free Speech Corner" in honor of the historic activities there of Mother Jones and U.S. Secretary of Labor Frances Perkins. Elliott J. Gorn, Mother Jones: The Most Dangerous Woman in America (New York: Hill and Wang), 2001.